Two skateboarders and a photographer were trying to get a little work done on Oak Ave. across from the Carlsbad Village Inn this afternoon around 2 PM and had barely gotten their lighting set-up before they were literally swarmed by Carlsbad Police Officers: three cars and a motorcycle responded to this crime (man-on-man coverage?). The polite and cooperative skateboarders were told to put their hands behind their backs, told to spread their legs and then each of them were patted down, told to sit with their hands in their laps and then asked for their IDs. 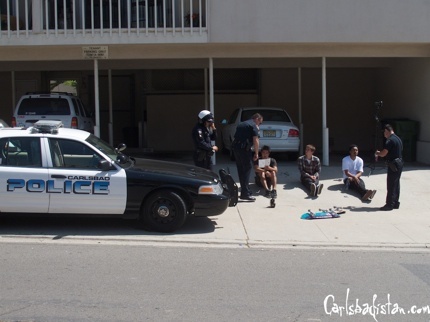 We do not believe any of the officers even saw either of the guys actually rolling on their skateboards. While we’re happy that Carlsbadistan’s finest are so quick on the response, we kind of wish that conscientious, working skateboarders were given a little less vigorous treatment. Maybe simply being asked to leave by one officer would have been more appropriate. But then, that’s just us, and we probably know too much about Carlsbadistan’s importance in skateboarding history to really understand the reality of skateboarding behind a crime in our city. Then at 10 AM he posted notes to the location of the first drop. It was on Palomar Oaks Way just south of Palomar Airport Rd. for the kids in the 760. 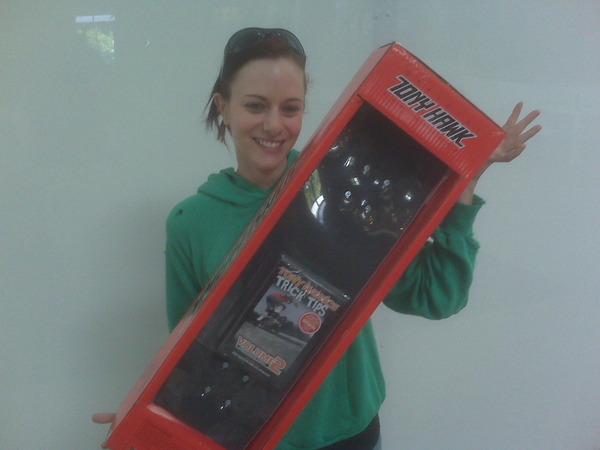 Let the Twitter scavenger meme begin. . .and follow Tony because he says he’s got more skateboards to give away. 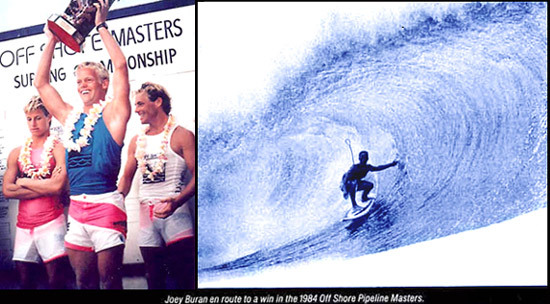 Joey Buran began surfing 1973 and went on to become one of the best surfers ever to come from Carlsbadistan. Now, 36 year’s later Joey is joining Quiksilver co-founder Jeff Hakman, Endlesss Summer director Bruce Brown, and surfer Pat O’Connell as inductees into the Surfers’ Hall of Fame on Friday, July 24, 2009 in front of Huntington Surf & Sport in Huntington Beach, California. Buran began life landlocked in the mid-west (Cleveland), but moved to Carlsbad in 1972. He started surfing in 1973 at the age of 12 and by 1975 was already ranked as the top amateur surfer in California. After turning pro in 1978 Buran defeated Rabbit Bartholomew in his inaugural man-on-man event, won his first pro title in Oceanside and reached the final round of the Pipeline Masters in Hawaii defeating, among others, two-time reigning champion Rory Russell. He received the nickname “California Kid” from ABC’s Wide World of Sports. Since then Buran has worked mostly as a pastor with Calvary Chapel and in 2007 became the head coach of the US National Surf Team. Congrats, Joey. You’ve done Carlsbad proud. If Poseidon Resources is granted a final permit on April 8th for the Carlsbad Desalination plant, it will require ENORMOUS AMOUNTS of energy to make new water. If upgraded, the North County and South Bay Water Reclamation plants would require LESS THAN HALF THE AMOUNT of energy to make new water of the same quality – and dramatically reduce discharge of partially treated sewage to our local marine environment. 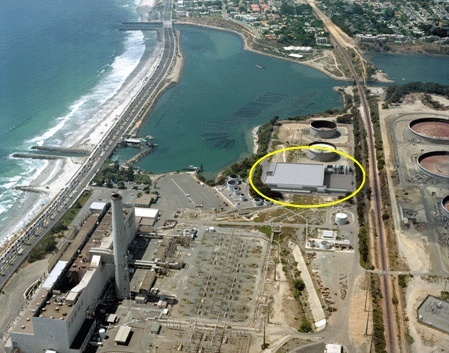 . . Carlsbad Desalination would kill millions of fish and larvae each day. North County and South Bay Water Reclamation plants would kill zero fish and larvae per day. 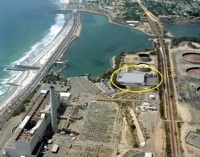 The Surfrider Foundation is also encouraging everyone to read and sign Surfrider and Coastkeeper’s petition to help prevent Poseidon from building such a wasteful and destructive desalination plant. Carlsbad, the undefeated Arizona mighty mite, bumped it up to five wins in a row today to claim the $100,000 Santa Paula Stakes at Santa Anita Park in Arcadia, California. Owned by her breeder, Dennis Weir, Carlsbad won her four starts in Arizona by a combined margin of more than 50 lengths. 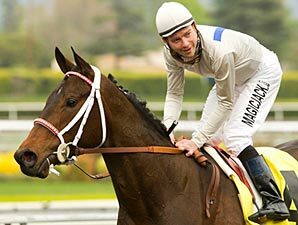 Weir transferred the Arizona-bred daughter of Rocky Bar to the Southern California barn of Jeff Mullins after she captured the Arizona Oaks by 13 1/4 lengths Feb. 21. She began her career last fall at Turf Paradise with Kevin Lewis. We’re kind of bummed we were there because we would have bet on her to win. The only way a horse could have a better name would be if it was Carslbadistan. In their new book Undress For Success: The Naked Truth About Making Money at Home (released last week by John Wiley & Sons), Carlsbadistan based writers Kate Lister and Tom Harnish explain the ins and outs of working from home. Do you dream of working from home? Are you sick of the work-at-home scams and the miscreants who pretend to show you the way? Are you tired of the ‘make money while you sleep’ ads? . 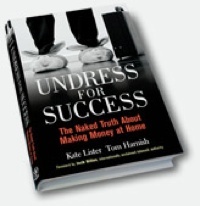 . . Undress for Success delivers a real-world, step-by-step guide to how you can earn a living as a home-based employee, freelancer, or entrepreneur. . . If you’re bummed out, burned out, and stressed out and eager to trade your business suit for a sweatsuit, we’ll show you the way home. Sounds like exactly what we’re looking for. We haven’t read the book yet, but hopefully they’ll answer the biggest question we’ve been having lately: how do you get any work done at home when you live in the most beautiful city in the world and the beach is just a short walk away? 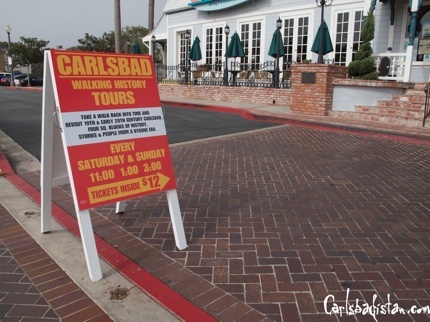 With all the storms and floods we’ve been seeing on the news, we thought we cruise to the beach to see how Carlsbadistan is holding up. We ended up with a minute and a half of exactly why people who live anywhere else always say they hate us. . .
Ouch. Click the link for the rest of the story. 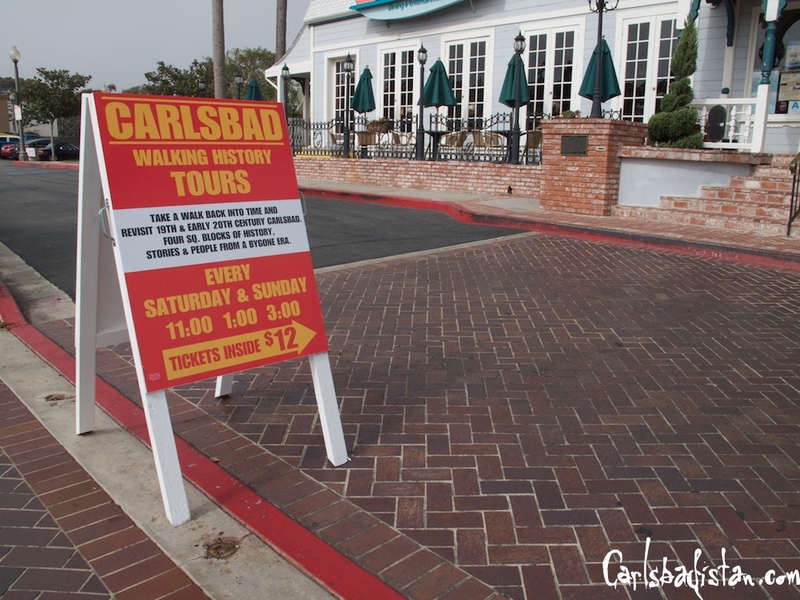 Walks are lead by amateur historian George Hruby every Saturday and Sunday at 11 AM, 1 PM and 3 PM. Tickets are $12 and available for purchase at The Ocean House Restaurant. Lisa Snyder, the general manager of the Village Faire Shopping Center, was rooting around in the attic above Carlsbadistan’s Ocean House Restaurant when she found a tube containing a long-lost “22-foot-long, 6-foot-high painting that once hung on the wall” of the restaurant, according to a Michael Burge story in the San Diego Union-Tribune. 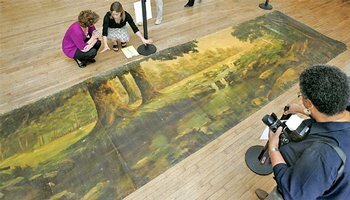 The painting was one of three that had been tacked up in the old restaurant, which was known in its heyday as “The Twin Inns.” . . .The canvas – yellowed and slightly misshapen – shows a bosky, pastoral scene and has a signature in the bottom right corner: “J. Morton Patterson, 1/25.” . . . Snyder said the owners haven’t decided what to do with the rediscovered treasure. . . . “It’s more of historic significance than monetary,” she said. We’ve always wondered what was in those haunted upper rooms.